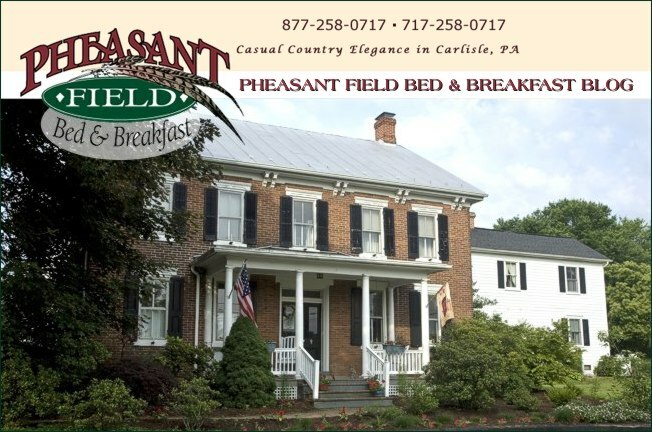 Pheasant Field Bed & Breakfast is participating in the B&Bs for Vets "thank you" program on Sunday. The cool thing is that 4 couples just checked in for tonight and tomorrow night. They are all Navy veterans, some of whom retired very recently. It was a pleasure just watching them greet each other! Our B&B will be completely full of Vets tomorrow night. We are pleased to be able to say "thanks" in this way! Remember to honor a veteran tomorrow (and every day!)! The Antique Auto Club of America - in Hershey - will be honoring veterans with FREE admission on Sunday, 11/11/12. Hershey is an easy drive from Pheasant Field. The Mechanicsburg Museum will present "WWII In Their Own Words" on Veteran's Day at 2 PM. The event, which features stories from WW II veterans, is open to the public. To all our veterans, we say "THANK YOU" from everyone at Pheasant Field B&B.